The antihistaminic drug methapyrilene was withdrawn from the market in 1979 because of hepatocarcinogenicity in rats. 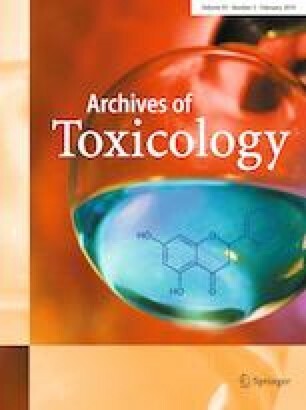 Since then, the drug has been used as a model hepatotoxin especially for transcriptomic analyses using material from in vivo studies. Much less transcriptomics data are available from in vitro studies, and no studies have investigated proteomic effects of methapyrilene in vitro. Thus, the present study was aimed to characterize the proteomic response of primary rat hepatocytes to methapyrilene, to broaden our knowledge on the molecular mechanisms of methapyrilene toxicity, and to compare the results of collagen sandwich-cultured hepatocytes to in vivo data. In vitro methapyrilene concentrations (0.39 µM, 6.25 µM, and 100 µM) were chosen to cover an in vivo-relevant range. Based on published pharmacokinetic data they correspond to concentrations in portal vein blood for previously in vivo-tested doses of methapyrilene, up to a concentration showing slight cytotoxicity. Analysis of proteomic alterations by two-dimensional gel electrophoresis and mass-spectrometric protein identification demonstrated consistent and concentration-dependent effects of methapyrilene, in particular on mitochondrial proteins. Data suggest substantial deregulation of amino acid and ammonia metabolism and effects on mitochondrial energy supply pathways. The effects identified in vitro concur well with into previous in vivo observations. Several effects, for example, the influence of methapyrilene on S-adenosylmethionine metabolism, have not been described previously. The data suggest that already non-toxic concentrations of methapyrilene alter components of the intermediary metabolism, such as branched-chain amino acid metabolism, as well as urea and tricarboxylic cycle enzymes. In summary, data substantially add to our knowledge on molecular mechanisms of methapyrilene hepatotoxicity at the protein level. The online version of this article ( https://doi.org/10.1007/s00204-018-2360-3) contains supplementary material, which is available to authorized users. The work was supported by the German Federal Ministry of Education and Research [grant no. 0313854A] and the German Federal Institute for Risk Assessment (Grant No. 1322- 416). Technical assistance by Christine Meckert, Christel Rozycki and Stefanie Sawada is greatly acknowledged. The authors also thank M. Schug for help with hepatocyte preparation.